See you at Drinktec 2009! An array of new solutions for the PET/PP blowing and for the end-of-line operations will be presented by SMI in worldwide preview during Drinktec 2009. The constant commitment of SMI R&D center in the search for new solutions and in the development of new technologies will be shown at Smigroup's stand during Drinktec 2009. Visitors will have the opportunity to take a close look at an array of new machines characterised by advanced technical solutions, high yield, top environmental compatibility and very low total costs of operation (TCO). Innovation: a key factor in the stretch-blow moulding of versatile containers with low environmental impact. SMI rotary stretch-blow molders, manufactured by Smiform division, allow to shift from the blow molding of containers in PET to the production of PP containers (and vice-versa), without changing the machine configuration, thus ensuring to the end user a trouble-free bottle-manufacturing process at extremely low operating costs. At Drinktec 2009, SMI will be presenting a Smiform SR 8 model, a 8-cavity blow moulder dedicated to the manufacture of 0.5 liter PET water bottles, deriving from 9.94-gr. preforms. This solution, designed to match the most severe environment care criteria (less plastic = less oil = less pollution), is capable of guaranteeing remarkable money savings, as it ensures very low TCO (Total Costs of Ownership) of the machine. Starting from the plastic's proper flexibility, and accurately intervening on the bottle's final shape, today it is possible to produce very light containers, featuring stability and resistance properties nearly identical to those of heavier preform containers. SMI's new solution for the end-of-line: high reliability, high production performances and excellent quality/price ratio. 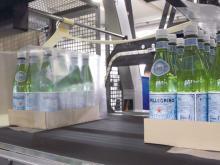 At Drinktec 2009 SMI will also be presenting the updated version of SK shrinkwrappers. The model displayed, a SK 600T, is an innovative packaging machine featuring high production yields, top flexibility, ease of use and low energy consumption. 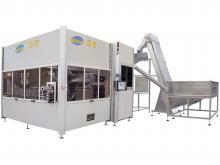 The great versatility of this model, capable of producting up to 60 packs/minute in single lane operations, is further enhanced by an advanced automation and control system, fully developed by SMI, which allows to arrange new pack sizes and new format changes quickly and accurately. For the automation of the SK 600T shrinkwrapper, SMI has chosen the SERCOS III interface to control the motion axes and to exchange data with the I/O devices mounted on the machine. reduces the spare parts to handle. The SK 600 T on display at Drinktec 2009 is also equipped with an automatic format change device at the machine infeed and with a new "stand alone" shrinking tunnel. 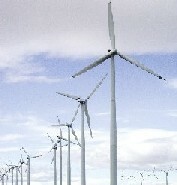 The latter is available in both the electrically-powered and the methane-powered version. The automatic adjustment device for format change at the machine infeed simplifies the operator's work considerably, as nearly no manual adjustment is required. This turns into dramatic reduction of the change over time, enabling quick shifts from a pack size to another, with great benefits to all users who, thanks to the SK machines' outstanding versatility, can handle many different types of containers in countless packaging configurations. Don't miss the opportunity to discover Smigroup's latest blowing and end-of-line solutions! We look forward to meeting you at our stand, HALL A6 STAND 302, and we remain at your disposal for any further information you might need.